The Chicago Blackhawks are now on the cusp of winning the Stanley Cup for the second time in four seasons. After edging the Boston Bruins in game five of the Stanley Cup Final, all of the momentum appears to be on their side. Blackhawks goaltender Corey Crawford bounced back in game five after giving four goals in game four. As usual, the Blackhawks who aren’t sold on Crawford wanted him to be replaced Ray Emery. The goaltending the team got on Saturday night definitely quieted the concerns. If the Blackhawks win the Stanley Cup tonight, I hope that one of the first players to hoist the cup after Jonathan Toews would Crawford. That would be a well-deserved honor. Game six will be the team’s toughest game this season. 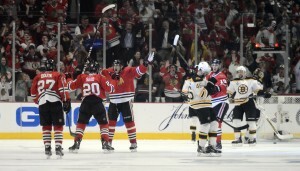 Not because the Bruins are a formidable opponent at home, the pressure to end the series will be on the Blackhawks. They know what to expect since they have been down this road before. The Blackhawks may have figured out Zdeno Chara after Chara was on the ice for all of the goals scored by the Blackhawks in game four, he was on the ice for two more Saturday night. Have the Blackhawks figured Chara out? That remains to be seen since there is potentially a lot more hockey to be played. I think I do know is that the team appears not be intimidated by for 6’9” menacing captain. One of the things that the Blackhawks can continue to do is attack the net to create scoring opportunities. A shot on goal at close range should to immediately followed up another. 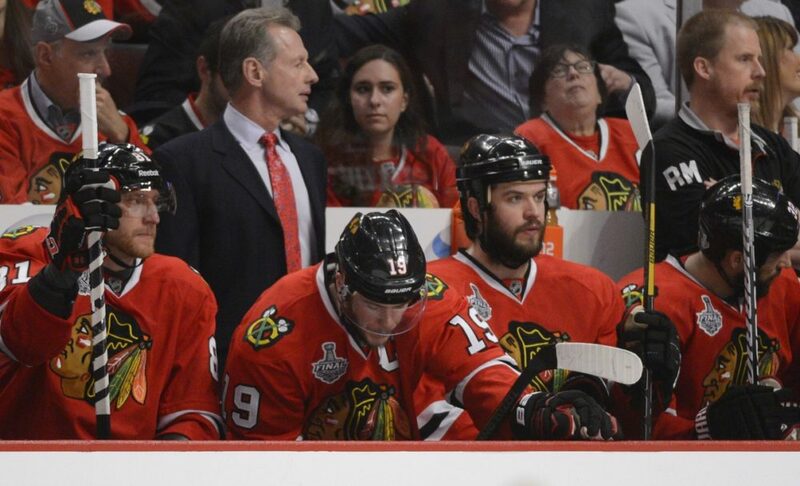 That type of play is what got the Blackhawks back into the series. After game five, the biggest question that was asked by the fans and the media was surrounding the health of team captain Jonathan Toews. The concussion history of the Selke Trophy winner is well documented. Earlier this season, Toews admitted that he probably shouldn’t have played in last year playoffs after sustaining a concussion. It was one of those hits in a tight area in front of the net. You can be vulnerable in that area for a big hit. The first part of contact we could talk about, but … I’m not going to go there. If Toews can’t go, the team will make a series of moves to compensate for the loss. While it is nice to speculate what’s going to happen in tonight, one thing that we all can count on is that the Bruins will do everything in their power to stop a Stanley Cup winning celebration on their home ice. Expect their best effort to date. But then again the Blackhawks will give a similar effort. Prediction: Expect for the men in the Indianhead sweaters to celebrating a Stanley Cup victory.